• What does customer service mean to you and how is it defined in your organization? • Will your employees say the definition of good customer service is clear to all? • Are you confident delivering good customer service is easy to validate? • Do your customers confirm that you indeed provide good customer service? • Does the culture of your organization enable good customer service? Simply saying you provide good customer service and hiring good people, who have customer service skills, does not guarantee you will deliver good customer service in the eyes of your customers. 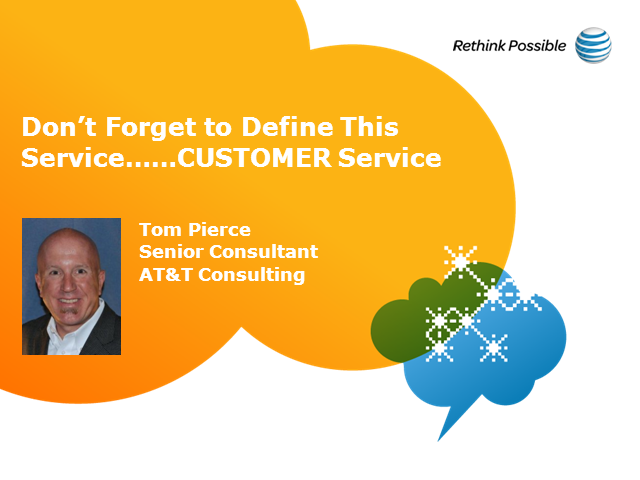 • Does your organization consider itself a Service Provider? • Who owns customer service in your organization? • Can you easily quantify the value of great customer service and the pitfalls of poor customer service? • Is it crystal clear to everyone in your organization what it means to deliver great customer service and the VALUE of customer service? The discussion will focus upon the above information, tips and barriers to providing excellent customer service, in addition to examples of great and not so great customer service in practice today.